Browse Seymour Duncan | Musical Instruments | GAK. Seymour Duncan is one of the original retro-fit pick-up pioneers. Having worked on the guitars of players such as Jeff Beck, Eric Clapton, Jimi Hendrix and Jimmy Page in the '60 and '70s he went on to found Seymour Duncan Pickups in '76. From here on in Seymour Duncan Pickups have continued to design and manufacture some of the best sounding pickups in the world. Here at GAK, we have a large range of Seymour Duncan products including Pickups such as the Active Blackout collection, effects pedals like the powerful Palladium Gain Stage Overdrive and more. 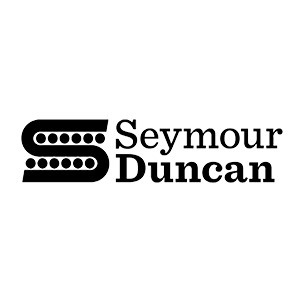 If you have any inquiries regarding Seymour Duncan products then please don't hesitate in contacting one of our specialists in store by calling 01273 665 400. Classic Overdrive pedal designed using the legendary 808 chip as a starting point but with an expanded gain range and 3-band active EQ. The ultimate Hot Rodded Humbucker Set. Articulate and bright, but sweetened with age in our Custom Shop. Gives you the quintessential strat sound, from spiky surf to quacky funk and mellow blues. Seymour wound this Tele rhythm pickup as the perfect match for the unique picking style and intricate bends he used on his mid-60s maple neck Tele. The Seymour Duncan Antiquity II for Precision Bass replica pickup is the pure look and sound of the '60s tradition.